Every girl’s hope is to one day be happily married to the man of her dreams and that is the most special day of her life. From the wedding gown, to the bridesmaid’s shoes, things are always planned in advance to make sure that the day is smooth-flowing. 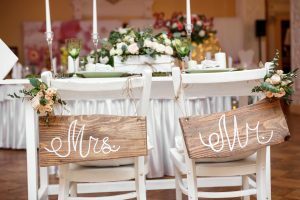 However, the most important thing to do on the day of your wedding is to enjoy each and every aspect of it, including, enjoying the presence of your loved who especially visit you for your wedding. Therefore, your mind needs to be free of worry and stress on the big day for you to relax and enjoy. Therefore, follow the following steps to ensure that your wedding is the day of your dreams. As crazy as it might sound, planning the function is much harder than you might imagine. Start it with a wedding planning tool. Many such tools are available online for free and can be customized for your needs. Fill in all the blanks and the boxes with your requirement and you are good to get started! The location is absolutely open for the couple to decide on based on the budget and the liking. Many reputed places offer seasonal discounts for weddings which could be enjoyed if booked early. Whether it is a grand banquet hall or a quiet and beautiful sea shore, this is the place where your story will unravel, so, choose wise! Having a well experienced stylist is crucial if you want to look absolutely dashing. Talk to your friends about their own stylists and make a few appointments to check out a few selected ones before you decide which one to go for. The most important outcome of your wedding other than the couple itself would be the memories captured through photos and videos. It is absolutely essential to plan the destination wedding photography well before the wedding so you know that all the good memories are being captured for you to reminisce later on. Decide on the cuisine that you want to serve your guests with depending on the liking of the couple and of course depending on the crowd. There are special caterers who are specialized for big functions like weddings. Make sure you do a taste test of the menu before deciding the ultimate caterer. Make sure you run through your list top to bottom every day, starting from the location, stylist, Cancun wedding photographer, and caterers so that you will not miss the tiny details amidst the rush. A great tip for a successful wedding would be to allocate separate duties on the day to trustworthy friends and family members, so that on the day, you can sit back and enjoy the show! ← How To Make A Couple Comfortable During A Shoot? How To Hire A Videographer For Your Wedding?